Kids—and teachers too—soak up lots of information through video. What do you love about using video your classroom? Submit a comment to this blog and you could win an assortment of literature-based videos from Weston Woods. 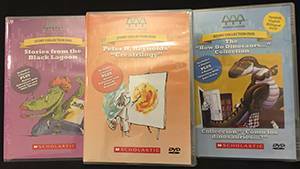 Our prize pack includes Stories from the Black Lagoon, The How Do Dinosaurs Collection, and the Peter H. Reynolds Creatrilogy Collection, including The Dot, Ish, and Sky Color. Submit your comment by Tuesday, December 5, to be included in our random drawing. Here are some great resources for using video in your classroom. Roll ’em! Imagine your students getting a chance to tour an automotive plant, watch an ornithologist work, or explore a career as an architect. You’ll find lots of opportunities to explore STEM and STEAM opportunities with the free version of nepris.com. One of my favorite teacher tech blogs has a new video about—what else?—teaching with video. Check it out here. Be sure to sign up for Free Technology for Teachers blog updates, too. Welcome to Check 123, the world’s first video encyclopedia. It has more than 20,000 curated videos from around the world. Sign up for free to use the videos at check123.com. Remember, submit those comments for your chance to win! PS: Time is running out on the Fall WIN contests from Learning magazine. Click here to enter now. I love using the comparison of video to print materials. It helps bring the book to life for the students. Videos bring life to any story! It’s like a field trip! These look like helpful resources. I am going to check them out! My little ones with autism engage so much better with a video, than with me reading (no matter how animated I am!). They are a great way to introduce a book. I would love to have these as a resource in my classroom! We love to use storybook videos as a transition from school time to lunch. Dimming the lights and getting comfy for a few minutes really helps the children relax before lunch. The bonus is they are hearing more voices read to them then just our teachers. Everyone reads differently so it is nice to listen to others. The dvd’s usually are very verbally animated!! Love it!! I love using videos that show the words to songs, words to stories, etc. I believe it helps students learn that the words they hear can be written down. They learn the connection. Also, videos take the place of field trips that are not possible. Obviously we can’t take a trip to a lion’s natural habitat, but we can see the habitat on video. I love all those books!! I would love to win them! I want them please! One can never have too many videos! I teach ELL students and they need to see and experience life to uderstand and translate it. Videos and technology allows me to teach them. I use video daily in my classroom for teaching content and for brain breaks! It makes all the difference! Video allows me to build much needed schema for my special needs classroom. All of my students come from underprivileged homes and many are ELL students as well so I love to show them a concept rather just tell them about it. Thanks for the chance to expand our video library! 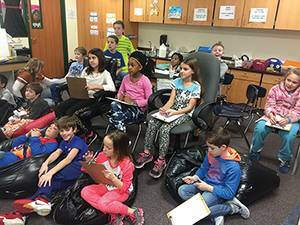 Videos in the classroom enhance student learning by bringing characters to life. My students would love to see these books come to life. My students love to hear and watch the video version of books. My students really enjoy watching books on the big screen after we have read them together. I love sharing videos with books that we read. We always like to compare the 2 to see if they are the same. I love videos because they help to get students even more interested in the story! Happy Thanksgiving! Thanks for all the great giveaways. Your generosity it truly appreciated. My class loves to watch DVDS. They are crazy about dinosaurs. It helps to present a lesson in many formats when you’re working with students that have limited experiences and depend on school field trips to explore their local community. Video also enhances a lesson for all visual learners as well as all ELL learners. What an awesome opportunity to bridge print resources to video resources – a great way to explain to students different media and their uses. FABULOUS give away, thanks! I use videos to reach visual and auditory learners. What great videos resources to add to those I have been able to use. Our school corp has blocked so many that we used to use. Thank you. My students love to hear the book and then listen and watch the stories on video. Using videos resources in the classroom make the stories come to life. i love seeing the lit up eyes when the children see the characters we’ve been reading come to life on the screen. We use videos as some children need visual to comprehend better.